1. It realizes continuous feeding and continuous carbonization production technology, which has overcome the problem that the traditional carbonization equipment can’t continuously carbonize and has greatly improved the efficiency of production. 2. Intelligent controlling: this kind of equipment adopts intelligent controlling system, which can save manpower and realize rapid development from original hand-workshop to high-efficiency, automatic and intelligent production. 3. Environmental protection: the biomass charcoal making machine makes use of organic matter for production and turns waste to treasure. It doesn’t need to cut trees for raw materials and will not damage the ecological environment. 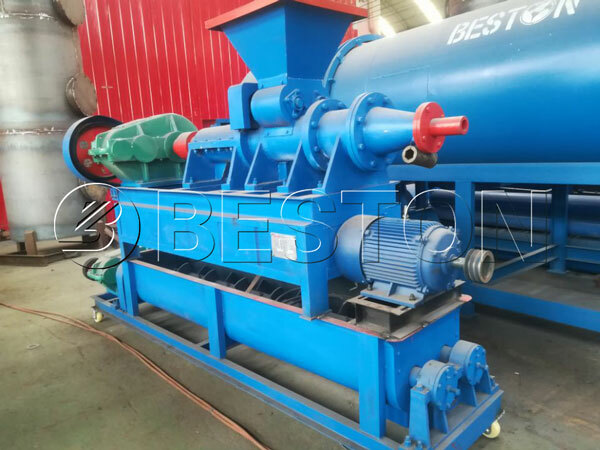 The biochar equipment realizes the co-production technology of “charcoal, gas, oil, fertilizer”, and solves the technical defects of high energy consumption, large pollution and low efficiency of traditional equipment. 4. High efficiency and energy-saving: this kind of equipment realizes the technology of high temperature, continuous and multi-layer carbonization. It doesn’t need cooling while discharging of charcoal, which fully realizes the advantage of high efficiency and energy-saving. The fixed content of the finished charcoal is above 80%, and the calorific value is 7500-8000kcal/kg, while the fixed content of wood charcoal is low and the calorific value is about 6500kcal/kg. 5. 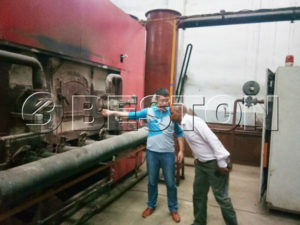 The collection of by-products: in the process of carbonization, the machine can automatically collect tar, wood vinegar and combustible gas, which has achieved high efficiency and comprehensive use of renewable resource – the charcoal produced by smoke-free continuous carbinozation machine. 6. Low content of water: within 5%, the content of common charcoal is bigger. 7. No chemical materials, non-toxic and odorless, non-pollution, etc. : regard waste as raw materials, such as peanut shells, sawdust, corn stalks, sugarcane, twigs, rice husks, bamboo shavings, sorghum rods, sunflower husks, distiller’s grains, corn cobs, coconut shells, coffee ground, cotton bar, beanstalk, taro grass and dry leaves, the biochar making machine can make high-quality and environmental charcoal or charcoal powder through high temperature. The charcoal materials produced by continuous charcoal machine is clean and non-toxic with high thermal energy, good marketing sales and bright prospects. The biomass charcoal machine also has many other features. If you want to learn more about the machine, please contact us right now!